While driveways, sidewalks and streets are being cleared during the multiple snow storms that have hit Southern New Hampshire and New Hampshire’s Seacoast, there’s one place the snow is piling up in massive amounts – Your Roof! If you have 6 or more inches of snow on your roof it could add hundreds if not thousands of pounds. Think about a foot of snow, this amount is easy to accumulate. That foot can be thousands of pounds and could cause your roof to collapse! It can be very dangerous for homeowners to get up on their roof in the winter. We advise those that can’t remove the snow from the ground with a roof rake to call the professionals for help. Don’t wait for the damage to occur. Generally, for the fraction of most typical deductibles you can get the snow removed from your roof and avoid the hassle of filing a claim and having your walls and ceilings torn apart for repair. Not only should homeowners be concerned with the weight of the snow, in NH it can be the ice damming that causes most of the problems. What happens is, the snow covers the ventilation systems and if it is not removed the heat from your home gets trapped in the attic consequently warming the roofs decking causing the snow to start melting from the bottom. Since heat rises, this melting will generally start at the ridge of the roof causing water to run down to the gutters and eaves. Once the water hits a cold gutter and eaves it refreezes. The ice eventually backs up under the roofing system or behind a fascia board where it melts again, ultimately soaking your walls and ceiling while destroying everything in its path. If this happens, notify your insurance company immediately. 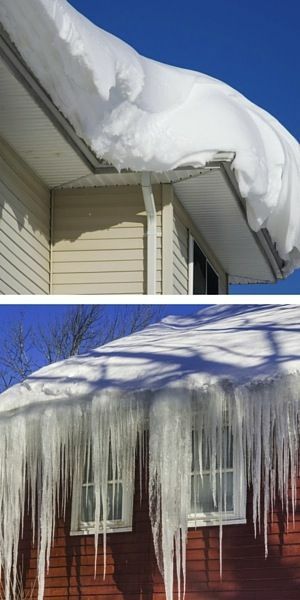 If you are a victim of severe ice dams, or have a heavy load of snow on your roof and would like to prevent damage. We have full time crews out daily shoveling Hampton, Hampton Falls, North Hampton and Seabrook roofs all winter. If you have any questions or would like to be put on the schedule, give us a call or fill out our contact form.